Paul Jones’s new exhibition Time Lines opens 28 February 2015. SENSORY FEAST Friday 5 April from 6.30pm. Tickets: £25 from Sladers Yard: Artists’ talk with Paul Jones and furniture designer Petter Southall, music from the Europa String Band and a seafood and vegetarian buffet feast. To launch the Dorset Visual Arts Art Trail weekend. Phone 01308 459511 to book. This major solo exhibition of Paul Jones’s work includes three groups of new paintings that cohere into a dazzling showcase of the ideas and vision he has built up over the last fifteen years, seeking to explore and re-invent the complexities of coastline, geology and landscape. Two of the groups, Out of the Blue and Stones, concentrate on the ‘edge’ of landscape, that moment of transition between earth, air and water and the coincidence of a common geology in far apart places. The third, Cranborne, plays with the intangibilities between memory and observation in well loved places. Paul Jones was a scholarship student at Bath Academy of Art, Corsham at a time when Adrian Heath, Robyn Denny and Howard Hodgkin were his tutors. After achieving his NDD he taught Art and Ceramics at BournvilleGrammar School and in 1969 was elected a Fellow of the Royal Society of Arts. His first major exhibition was in 1979 since when he has continued to exhibit nationally. 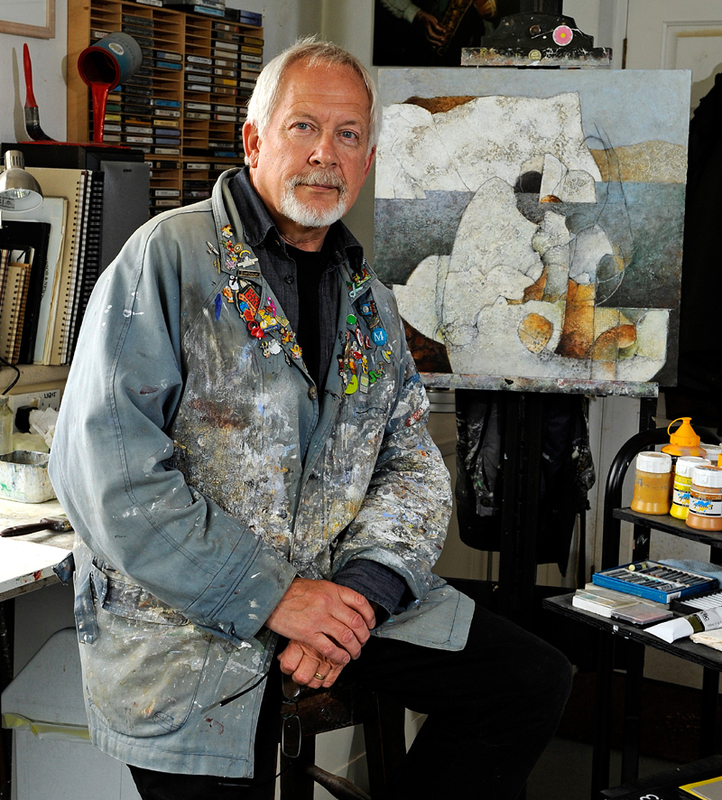 His work is held in both private and corporate collections. His recently published second book, Overview brings together many of his paintings, drawings and poetry of the last four decades. ‘Paul Jones is at his best as an artist when he looks underneath the surface of place; or down onto it as if in a kind of static flight. In doing so he relinquishes formulaic description for an earthy and sometimes even mystical symbolism: a gathering of magnetic shapes and eroded surfaces in a neo-romantic assemblage. These places seem to evince the pull of geographic as well as philosophic forces, as if a place is compounded of its ancient pasts, stratified by deep time. Jones will magnify a gleaming micaceous chip into a landscape of its own; or hover alongside a cliff face and find abstract pattern from massive rock formations. This is an art respectful of the geography of remarkable places, often at the edge of cliff and sea, windswept in its mood. Its place is within a British neo-romantic tradition of painting, as its best when it hovers between representation and abstraction.’ Professor Simon Olding, University College for the Creative Arts, Farnham. All paintings are acrylic/mixed media on board or canvas board and framed with tulip wood mounted on museum quality board. Please click on images to enlarge them. Reserved paintings may become available. Please do phone 01308 459511 or email anna@sladersyard.co.uk to enquire. Out of the Blue continues Jones’s ever-popular fascination with coastal landscape and chalk cliffs painted in subtle cold blues and off-whites in large textured works of strong clear composition. 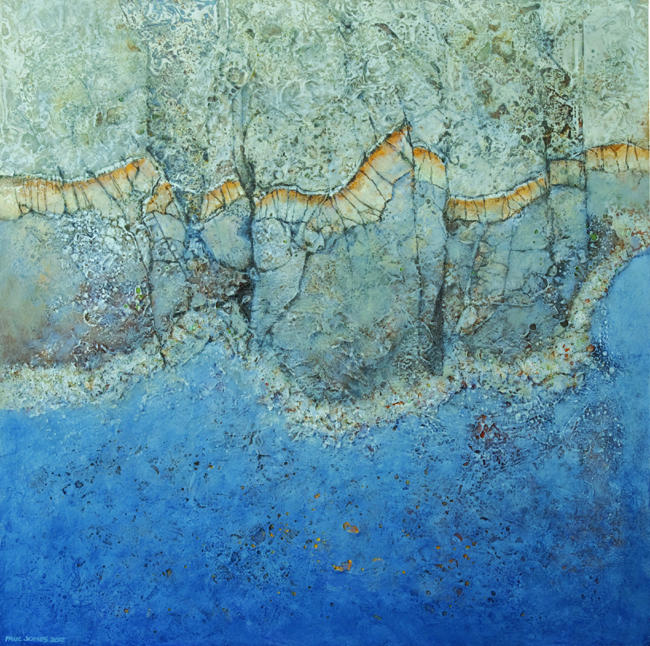 The series of paintings entitled Stones is inspired by some fifty million year old stones from the Appenine Mountains called Paesina stones. The artist’s perception that the patterns and colours on the stones held a startling similarity to his beloved limestone cliffs at Purbeck sparked these works which draw the collosal out of the minute in a conflation of scale, memory and observation. The Cranborne series follows a specific walk that Paul Jones has taken many times over the years on the ancient Dorset chalk plateau, Cranborne Chase. This journey is more than just travelling from one point to another. It is a homage to the past, both the antiquity of the place and his own personal history, charting significant places and ideas. If you would like to reserve or buy one of Paul Jones’s paintings, or a book, please email anna@sladersyard.co.uk or phone 01308 459511.